Every moment is precious but we rarely appreciate that until it’s gone. A surgeon on call had to end a day with his son early to get back to work at the hospital. John Clarke (Adam Huss) didn’t know it was the last day he would ever spend with his son. Traumatized by the car crash, John blames himself for the death of his child. His guilt is destroying his marriage with his loving wife Chloe (Madeline Zima). John begins experiencing physical pain that can’t be explained by doctors. Physically there’s nothing wrong with him, no reason to cause the source of his pain. As his body deteriorates with no answers, John learns the only thing to ease his pain is the taste of human blood. A man Herb Morris (Grant Bowler) enters John’s life claiming to have the answers to his extremely rare form of PTSD where blood is the only cure. A grieving father is faced with a living a nightmare of torment or a lifestyle that would make him a monster. The Giles Daoust penned Painkillers turns the heartache of grieving a lost one into physical pain. Adam Huss deteriorates convincingly well playing an addict whose drug is blood. 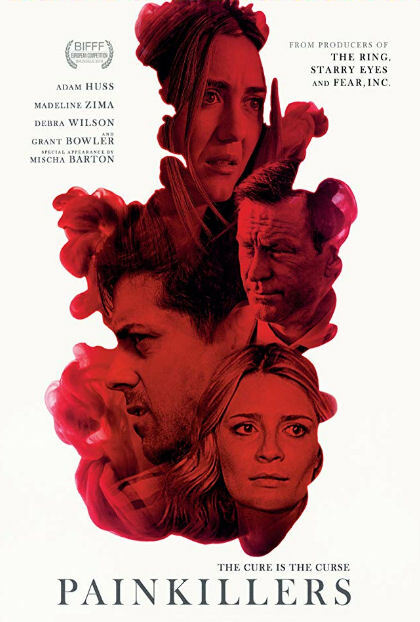 A brief slasher cameo from Mischa Barton opens up this world of blood sucking PTSD patients beyond the story we are told. It’s an interesting and original concept. Roxy Shih directs a feature of traumatized horrors. As a horror critic, I always chose horror but in the case of Painkillers the dramatic side of the film and especially Adam Huss’ performance is where this feature shines. Small details in Huss’ performance like shaking uncontrollably sell us on his withdrawal. I wanted the film to explore his deterioration deeper and I didn't need an explanation of why. His inner struggle to do what’s right is where the real drama in this blood sucking horror feature is.